Enrico Ramirez-Ruiz is the ninth UCSC faculty member to win a Packard Fellowship. Photo by T. Stephens. Enrico Ramirez-Ruiz has always been interested in cataclysmic cosmic events. Violent stellar interactions serve as natural experiments, enabling scientists to study exotic phenomena that cannot be created in a laboratory. "Some of the wildest, most elusive phenomena are revealing themselves as we begin to explore the universe in a more systematic way," said Ramirez-Ruiz, an assistant professor of astronomy and astrophysics at UC Santa Cruz and the latest young scientist at UCSC to receive a prestigious Packard Fellowship for Science and Engineering. "Observational astronomy is moving toward an era of celestial cinematography," he said. "Instead of static images of the sky, we are going to have a stream of data showing how the universe evolves in real time." A theoretical astrophysicist, Ramirez-Ruiz is developing the conceptual framework needed to understand the observational data coming from new telescopes and astronomical surveys. He uses computer simulations to explore transient phenomena such as collisions, mergers, and disruptions of stars--especially those involving compact objects like black holes, neutron stars, and white dwarfs. The simulations yield signatures for what certain events should look like, which can then be compared to observations. Ramirez-Ruiz works closely with observational astronomers and has been instrumental in many productive collaborations, according to Stan Woosley, professor of astronomy and astrophysics at UCSC and a leader in the field of high-energy astrophysics. "He is one of the top young scientists in his generation," Woosley said. "He works with everybody and is very good at getting observers and theorists together to pursue their common interests." A native of Mexico City, Ramirez-Ruiz came to UCSC in part because of the opportunities for collaborative projects between UC and Mexican scientists. He is currently involved in a project to build a 6.5-meter telescope in Mexico for the synoptic all-sky infrared (SASIR) survey. 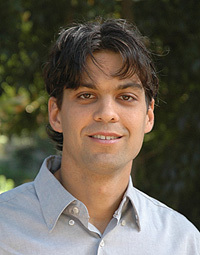 "Of course, the strength of the department was the main factor that attracted me to UCSC, but I also saw opportunities to make lasting connections and contributions to my country, and it has worked out really well," said Ramirez-Ruiz, who was named one of the 10 Best Mexican Young Scientists by a leading Mexican science magazine in 2006. The Packard Fellowship gives Ramirez-Ruiz $875,000 over the next five years to support his research. He is the ninth UCSC faculty member to receive a Packard Fellowship, awarded by the David and Lucile Packard Foundation to support young scientists and engineers who show exceptional promise and creativity. Previous recipients include astronomer Constance Rockosi in 2006 and anthropologist Nathaniel Dominy in 2007. Ramirez-Ruiz earned a B.S. in physics at the Universidad Nacional Autonoma de Mexico and a Ph.D. in astronomy and astrophysics at the University of Cambridge (U.K.). Before joining the UCSC faculty, he was a long-term member of the Institute for Advanced Study in Princeton, N.J.